My name is Jeanette Sumruld and I live in Crosby, Texas. I am married to my high school sweetheart and we celebrated our 33rd anniversary last August. I have two beautiful children - Ty (30) and Leigh (27). Leigh and I decide to start a blog to share some of the crafty things that we have done. We both fell in love with Pinterest and have been very inspired by the posts there. What a great way to share information - it is like a million magazines in one place and as my family can testify to, I am addicted to magazines. I scrapbook, craft and create, art journal, sew, quilt, crochet and make things! 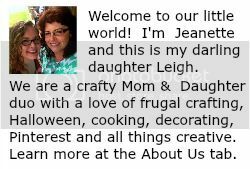 Leigh inherited my love of crafting (she really didn't have a choice as she has been surrounded by it her entire life!!) 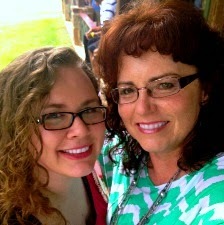 I'm so proud of my wonderful daughter! She graduated with her B.B.A. in accounting last year from Kennesaw State University and was working as a staff accountant in Atlanta before she moved back home to TEXAS!! she also became an accountant - just like me! As my Mom always says "Mirror, Mirror on the Wall, I've become my Mother after all". You can try to fight it, but eventually it happens to the best of us! Let us know what you think of our Blog. We are new to blogging and are learning as we go! Thanks for dropping in!